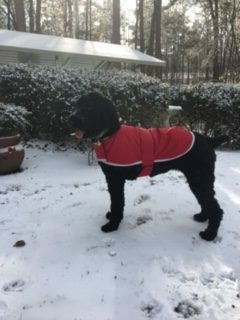 Hey Renee, Just thought I would send you an update and picture of Molly….she is a beautiful girl and still loves being outside. She loves playing with other dogs and is a real people dog!! Molly’s First Snow. She did not know what to think of this “white stuff” at first. But she quickly learned to run around the yard chasing birds and squirrels like normal!